are still suitable for subsequent analysis. Aggregation and stability can be very protein specific, but a general protocol is given below. 1. Determine the protein concentration (using eg. Bradford assay, BCA assay, absorbance at 280nm). tube and then add this stock to the protein solution. 5. 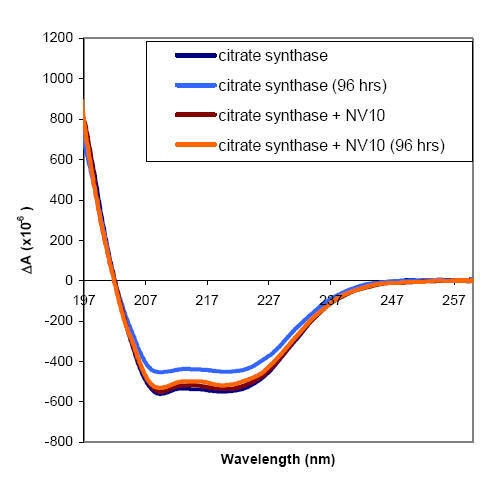 This protein / NV10 solution will be suitable for near and far-UV CD spectroscopy. 6. NV10 1X stock solution can be stored for 1 week at 4 oC or for longer term at -20 oC. • Always measure buffer blanks with buffer containing NV10. citrate synthase samples destined for CD analysis stabilises the protein without altering the secondary structure. 186 μg/ml NV10. Far-UV CD spectra of these samples were recorded at 22 oC in a 1 cm pathlength quartz cuvette. 96 hours, then allowed to warm to room temperature and the far-UV CD spectra were measured again. activity for citrate synthase in the presence of NV10 after storage for 96 hours at 4 oC. NV10 can protect protein structure and maintain stability in solution prior to CD analysis.